Cockney, Devonshire, Geordie, Liverpool, Yorkshire, London, Somerset, Welsh, Scottish, Southern Irish, Northern Irish. Neutral Californian, Alabama, Boston, Southern, New York, Bronx, Boston and mid-Atlantic. French, German, Spanish, Russian, Eastern European, Italian, Dutch and Swiss. Australian, Jamaican, South African (Africaans), Kiwi New Zealand and Canadian. Get that audition. Work on your accent today! We will work on an audition script or a role that you have been cast in. Break down the accent or dialect and get you sounding perfect. I do not rest until you get the sounds and intonation 100%. Go for 1 hour first and then we can decide where to go from there. If you are ready to book me, go to the bottom of the page and check my booking schedule. Click the SCHEDULE TIME WITH ME button. Check to see if there is a time that suits. If so then select the time and then pop back to the payment screen. Feel free to book and then email me for a time. The session is made up of 10 minutes each of preparation, recording and uploading the file. I will record the entire script with little or no intonation so that you can learn the words straight off the recording. I will record line by line leaving a gap between each line so that you can listen and repeat. Once you have those lines down and want to take it to the next level, you can book in for another 30-minute session. This can be a phone call or Skype session and we can then iron out any difficulties you may be experiencing. Accents available: English RP, Standard American, Southern American, Cockney, Liverpool, Scottish, Welsh, Irish, Devonshire/Somerset, German English, French English, and Russian/Eastern European. If you’d like to hear a professional dialect coach say your lines in the accent for you, you can send us a copy of your lines, and we’ll record them in the correct accent with some further explanations of pronunciation and terms. All prices are in NZ Dollars. Payment is via PayPal or you can use your VISA or MasterCard. After payment you will be redirection to complete your booking details and upload your script. 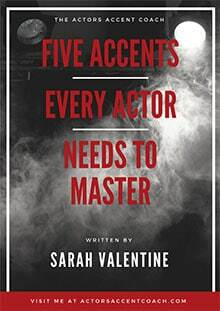 If you are on set and require me to come and work with multiple actors please email me on sarah@actorsaccentcoach.com to discuss rates, location and accents. I’m available to travel anywhere in the world. Accents available: English RP, Standard American, Southern American, Cockney, Liverpool, Scottish, Geordie, West Country, Birmingham, Lancashire, Manchester, South African, Indian, Jamaican, Welsh, Irish, Devonshire/Somerset, German English, French English, and Russian/Eastern European.